Autonomous Smart Office based in New York has created a new version of their SmartDesk which is now equipped with a touchscreen and integrated artificial intelligence to help you work smarter and be more productive during your day. Watch the video below to learn more about the SmartDesk 3 standing desk which launched via Kickstarter this week and is available to purchase priced at $499 for earlybird backers. SmartDesk 3 as capable of ordering you lunch as well as integrating with a number of smart devices currently available such as Nest, LiFX Light bulbs, Spotify and more. SmartDesk 3 is designed to save you time and pain. Interacting with your desk teaches it your priorities, so that is able to anticipate your needs and suggest the most efficient way to get things done. By paying attention to how you work, move and live, it recommends shortcuts to help you enhance your productivity and improve your health. SmartDesk 3 creates quick fixes that work long term. Streamline your workflow from your SmartDesk 3. Swipe, tap and pinch to speedily navigate through your favorite desktop apps and complete complex tasks in style. Let your fingers do the talking! Burnout in the brain starts in the feet. 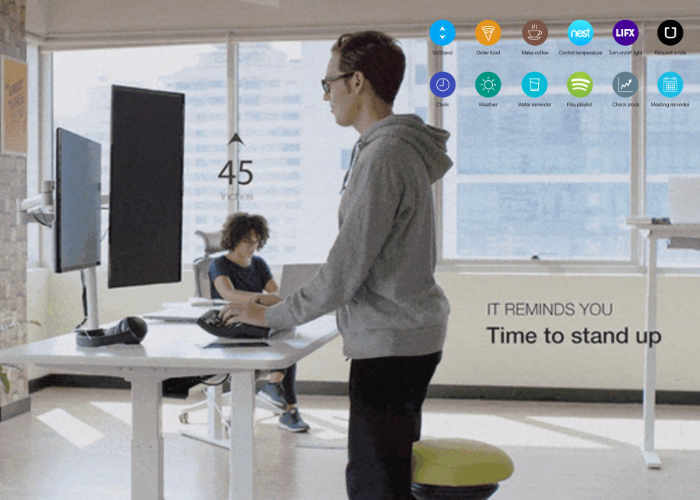 Throughout the day, SmartDesk 3 anticipates when you may get tired and suggests standing up or sitting down to keep you healthy and alert. Your new AI assistant makes it easy to combat burnout by reminding you at regular intervals to stay active, hydrated, and well-rested — all without compromising your productivity, workflow and focus. Visit the official SmartDesk 3 campaign page to learn more about the standing desk with integrated artificial intelligence and touchscreen by following the link below.